Olympic Dakar 2 Jacket - Edmond, OK Great jacket but more than I expected. 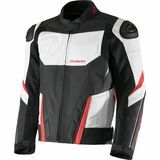 "Great jacket for the really rugged adventurist or cold/wet weather. 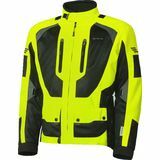 If you plan to do some tough riding and need a survival type jacket this is the one." Scharf2u - Sunnyvale CA Poor fit. "Just received the jacket today. It is completely un- usable in it's current form. Sleeves are huge, I could fit 3 of my arms in one sleeve. I've been wearing Olympia gear for years, I figured the leather jacket would fit well."